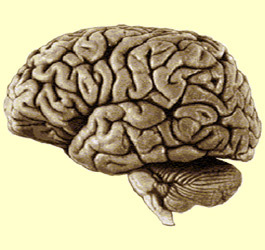 Here is a lateral view of the left side of a human brain. On the basis of their phylogenetic and ontogenetic origin, neuroanatomists generally classify the structures of the brain as shown below, from the most evolved to the most primitive. (Place your cursor over the name of each structure to see where it is located on the sagittal view of the brain). 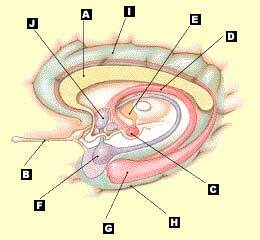 The structures listed below are often considered to constitute the limbic system. This system is involved in olfaction, emotions, learning, and memory. The limbic system was introduced as a concept by Paul MacLean in 1952 and was long considered the seat of the emotions. Though some of the structures included in this system are in fact involved in some emotional responses, we now know that it does not correspond exactly to any of the multiple emotional systems in the brain. 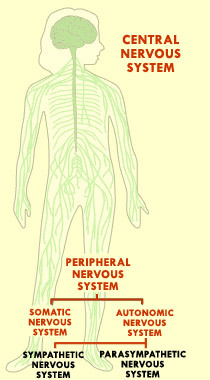 The autonomic nervous system is controlled mainly by the hypothalamus and is in turn divided into two sets of nerves: the sympathetic and parasympathetic nervous systems. Each of these two systems has a distinct anatomical location and communicates with its target organs through other neurons located in ganglia. The sympathetic nervous system goes into action to prepare the organism for physical or mental activity. When the organism faces a major stressor, it is the sympathetic nervous system that orchestrates the fight-or-flight response. It dilates the bronchi and the pupils, accelerates heart rate and respiration, and increases perspiration and arterial blood pressure, but reduces digestive activity. Two neurotransmitters are primarily associated with this system: epinephrine and norepinephrine. The activation of the parasympathetic nervous system causes a general slowdown in the body’s functions in order to conserve energy. Whatever was dilated, accelerated, or increased by the sympathetic nervous system is contracted, decelerated, or decreased by the parasympathetic nervous system. The only things that the parasympathetic nervous system augments are digestive functions and sexual appetite. One neurotransmitter is primarily associated with this system: acetylcholine.